Are you addicted to your cell phone? Then maybe you're sick and tired of paying a fat bill for it every month. Welcome to the league. Therefore, expenses like these won't climb down any sooner, rather they are bound to escalate, unless you do something to prevent that. If you are interested to optimize your monthly paycheck, then here are some ideas to help you resolve the dilemma with much aplomb. Make wise of the minutes - As per a recent market research, over 85 percent of the participants claimed to have put their calls on hold whenever they were conversing with a prospect. If these happen during the daytime (also referred to as âanytimeâ) minutes, which a lot of times they are, then those are certainly not so affordable. Hence, to cut back on inflating your monthly cell phone bills due to automated messaging services and to make wise use of your time, you can take advantage of different websites as well as online applications to register your appointments or schedule your upcoming events. There are actually a number of dedicated apps and websites for certain niches like restaurant reservations, doctors' appointments and so on. So, if you want to exploit an online deal to schedule an appointment, then you may take advantage of a suitable website that provides online booking service. Similarly, you can do the same to check any local movie timings from a relevant website. 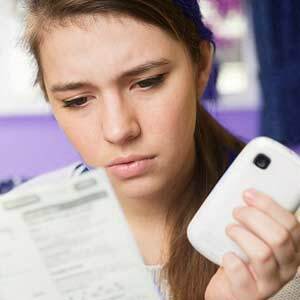 Jump to prepaid plans - Its normal for most of the consumers to fall-head-over-heals for two-year contracts since they are shipped with highly-subsidized cell phones. It is granted that no one actually enjoys paying $550 for an iPhone. However, plans like these will basically cost you quite an amount of money. On the other hand, opting for a prepaid, no-contract plan will eventually be a money saving move, depending upon the choice of your carrier. Moreover, there are certain contract-free carriers that will do their best to retain you as their customer and so, will see to that you keep continuing with the same plan. Drop text plans altogether - Another suitable way to lower your monthly cell phone bills is to reduce your texting costs and replace that with free texting applications (apps). To begin with, you can use apps like Pinger (available for both iOS and Android), WeChat (available for Windows , iOS and Android phone) and textPlus (Windows, iOS and Android). All the apps discussed here work like any other modern day texting apps. Take for instance, they have the instant notifications option found in all the texting apps worth mentioning. However, they make use of data and not texts in this regard. Hence, you may start depending more on data as well as Wi-Fi rather than on the text allotments given on your plan. These alternatives would help you to resolve the 160-character message dilemma. Here, you'd be happy to note that Pinger would provide you with a separate text phone number so that you can freely send in your text messages to both smartphones as well as non-smartphones alike. Smarten up your voicemail - To be precise, voicemails don't come for free. In case, you make calls to your voicemail during the day, then that will basically be charged as peak minutes. Surprisingly, a lot of people consider their voicemail as an extension of their cell phones that is definitely not a paid service. Fortunately, there a number of ways to duck paying for silly charges like these. One such trick is to call on your voicemail from either a landline or any other mobile number. All you'll have to do here is that dial in your cell phone number and press the star button the moment your voicemail message starts. Put in your voicemail PIN and you'll be able to check your mails at no cost at all. Apart from that, you can employ Google Voice as one of your money saving gimmicks. You can use it for sending both regular and visual voicemails since it has been developed with a speech-to-text functionality. Google Voice would allow you to read message or even download audio clips, if you want from a nearby Wi-Fi hotspot or a cellular network. The best part in this type of communication is that you don't waste any minutes and even get to read messages when screening for important calls. Look for discounts - If you are lucky enough to work with a large multi-national company (MNC), then you can easily qualify for a handsome wireless discount. Most of the large MNCs have a deal with the carriers at lucrative discounts that can be as high as 25 percent off on the monthly phone bills for their employees. However, you may have to switch carriers in order to take advantage of the discounts. It may happen that you aren't sure of whether or not your company has got a deal done with a particular carrier, but then you can at your initiative inquire with the wireless representatives to find out about that. The catch here is that these discounts are only available for main line of a typical family plan, hence, you must be smart enough to put the costliest phone of yours in that prime offer, particularly the phone that has got unlimited data. At the end of it all, you must shop around when it comes to choosing for the most suitable carrier out there in the market. Study and look not only at the leading ones like Sprint, Verizon, T-Mobile and AT&T, but learn to look beyond them too. There is a host of small carriers such as H20 Wireless or Simple Mobile working as Mobile Virtual Network Operators (MVNOs) that you can try for this purpose. Basically, they don't have a network of their own to operate. However, if you aren't demanding for the most recent, high-end smartphone, then you, most likely be able to enjoy a very affordable rate for their services.